Yet another boxing movie for the ages and one that is a true story as well. We follow Vinny Pazienza (Miles Teller), a world champion boxer go at it in the ring and we see him in his ups and downs. 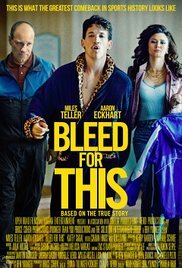 Bleed for This follows a tragic accident that leaves him wondering if he will ever box again. After a championship win, Vinny gets hit by another car, and this is when his story to recovery takes place. Vinny is a fighter through and through and even though he is asked by family and doctors that entering the ring is not a smart move or else his neck will completely fracture, he makes the complete effort to prove them all wrong. It is not a fast recovery and the hardships he goes through are tough. His trainer, Kevin Rooney (Aaron Eckhart), at first is one of the many who tells him to stop and think of something else to do in life. It is only when he sees Vinny struggling on his own and sees the fire in his heart that he goes a long and trains him. Bleed for This is a real story and one of sport's most incredible comebacks. Miles Teller did an amazing job as vinny and really brought the character to life. The story is heartfelt and just like other sport movies, this flick shows the hardships that one goes through for one to come out on top again. So if you like sports and inspirational movies go check this out, you won't be disappointed.